Silversea Cruises has launched its second expedition ship. Fresh from a major refurbishment, the 100-guest ship (formerly named Galapagos Explorer II) embarked September 28 on her first-ever voyage as Silver Galapagos. Prior to setting sail, a christening ceremony was held on board, attended by local dignitaries and company executives. Highlighting the occasion were speeches by Manfredi Lefebvre d'Ovidio, Silversea's chairman; Santiago Dunn, vice president of Silversea, Ecuador; and Conrad Combrink, Silversea's director of expedition cruises. Following the traditional blessing by a priest, the chairman's daughter, Costanza Lefebvre d'Ovidio, the ship's godmother, officially welcomed Silver Galapagos into the Silversea fleet by cutting a ceremonial ribbon. The all-suite Silver Galapagos has just completed a major stem-to-stern refurbishment. All public spaces and guest suites have been refreshed with new upholstery, carpeting, curtains, and wall treatments. Each suite is highlighted by a totally renovated bathroom, enhanced with rich marble detailing. Besides a new walk-in rainforest shower, each bathroom features a new vanity, shelving, mirrors, lighting fixtures, and wood flooring. Plus, all guest suites have been outfitted with new flat screen TVs, new mattresses (custom-made exclusively for Silversea), and luxurious Pratesi bed linens. Other ship enhancements include the installation of Wi-Fi access throughout the ship (including all suites) and a new complimentary service providing streaming movies and live television news broadcasts for guests to enjoy on their portable devices. And rounding out the renovations are a new fitness center, massage room, beauty salon, outdoor Jacuzzi, outdoor furniture, and Silversea's signature outdoor dining venue, The Grill. In his remarks at the christening ceremony, Lefebvre d'Ovidio stated, "It is our aim that this ship will not only offer our guests the highest level of comfort and service, but also enlighten them to the rarity and beauty of the Galápagos Islands." 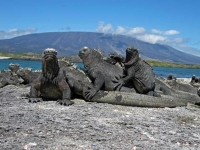 Silver Galapagos sails Saturday to Saturday on seven-day roundtrip voyages from Baltra Island, following either a western or north central route. These expedition cruises offer adventurous travelers the life-enriching chance to discover a wild, pristine paradise that has long been regarded as a natural laboratory of evolution. On complimentary expeditions ashore guided by an experienced expedition team (certified by the Galápagos National Park Service), Silversea's guests may experience up-close encounters with an abundance of wildlife that includes sun-basking land iguanas, giant tortoises, blue- and red-footed boobies, colorful marine iguanas, sea lions, penguins and Darwin's famous finches.